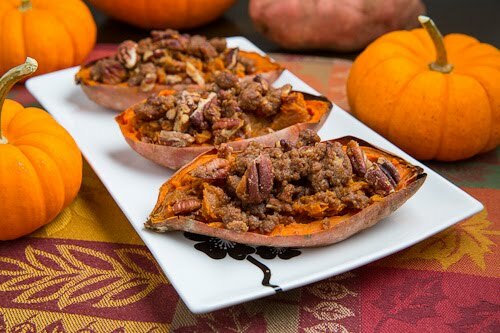 Creamy mashed maple bourbon sweet potatoes served in their skins topped with pecan streusel. One idea that I had for a new appetizer for Thanksgiving was to make some kind of savoury sweet potato potato skins and the only question that I had was what to fill them with? Every time I thought about sweet potatoes though, I kept thinking about sweet potato casserole so I decided to just go with it and I made some sweet potato casserole potato skins! A sweet potato casserole is a casserole made with sweet potatoes and it is commonly topped with pecans and sometimes marshmallows and even though it is sweet enough to be a dessert it is served as a side dish. 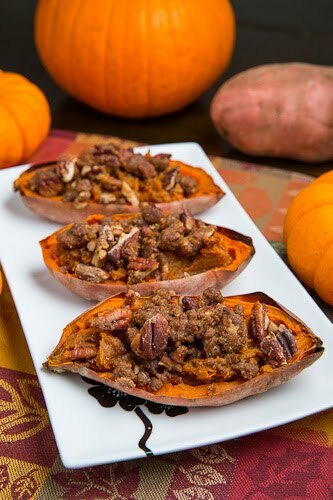 The basic idea behind these sweet potato potato skins was to bake the sweet potatoes until tender, scoop out the flesh, mash it and mix it up with common sweet potato casserole ingredients, stuffing the mixture back into the skins before topping with a pecan streusel and baking a second time! For the filling, I went with some of my favourite sweet potato casserole flavours including brown sugar, maple syrup and a splash of bourbon. Really you could consider each sweet potato potato skin to be and individually sized serving of sweet potato casserole! Pierce the sweet potatoes a few times with a fork, bake in a preheated 400F/200C oven until tender, about 45-60 minutes and let cool. Mix the sweet potatoes with the butter, brown sugar, maple syrup, bourbon and cinnamon and spoon it back into the kins. Bake in a preheated 350F/180C oven until the topping is a light golden brown, about 20 minutes. Do you eat the skins? Like you do on regular "potato skin" appetizers? These look devine! Just like the regular casserole but fancy. A great idea and fall treat! I'm really the only one in my family who even likes sweet potatoes so it's always impractical for me to make a whole casserole for myself…these are the perfect solution! Great timing! I am starting to work on my Thanksgiving menu, this is definitely on the list! Wow, yet again another great idea from Kevin! lol. This looks amazing. I want to make them!! oh my this looks amazing! I cannot wai tto try this! Another great idea for Thanksgiving! Love it! These look simply amazing! I love sweet potatoes. You have the best food blog and collection of recipes I have ever come across. I am really enjoying the explorations here. Stay inspired! Hello, I'm a new food blogger and I just came across your blog. It's great to see another male blogger in what is a mostly female arena. Your blog is full of great looking comfort food and I'll be following you. Great job! This brings the taste of Thanksgiving right up front. Sounds delicious Kevin. Delicious!! I love sweet potatoes, can't wait to try this special recipe. Anonymous: Yes, you eat the skins as well. Portion-controlled sweet potato casserole is exactly what this body needs!